Ave means bird in Spanish and the word zoo is a nasty one to my mind ... but it comes from the word zoological which means it is relative to animals ... and this particular place and organization is doing a lot of good. It has 146 acres of landscaped grounds and a wildlife rescue center for injured and confiscated wildlife, besides a restricted area for breeding macaws that are headed for extinction. Macaws fly free. 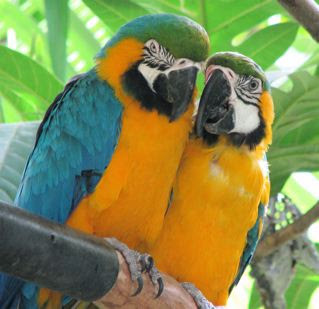 The bird collection is the largest in Central America and includes dozens of toucans, cranes, curassows, and parrots, resplendent quetzals, and more than 100 other Costa Rican bird species, but these are in enclosures. That's the hard part for me. Seeing wild animals in a limited space when they at one time they were so free. Although the animal may not be releasable, I feel the need to grieve their loss of freedom and wildness. I focus on the fact that their lives will be longer and that this place provides company for each species. They have pairs or groups so that no animal is alone. Reminds me of Noah's orders for the animals. There is a crocodile, deer, turtles, ostrich, tapirs, peccaries, pumas, and all four species of indigenous monkeys in large enclosures. It was comforting to see the animals "making it together." I believe with a friend or mate you can get through anything in life, and wild creatures are certainly more adaptable than we are. 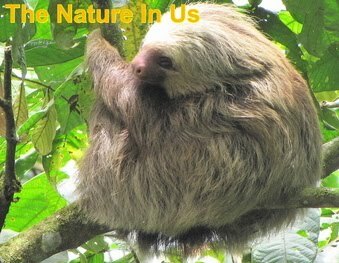 1) Environmental Education - There are wonderful descriptions of the different animal species and signs that inform about key threats to Costa Rican wildlife. They speak directly to the local people regarding such issues as killing iguanas for meat and capturing birds for the pet trade. Signs explain why these things are not good for Costa Rica. Although most people visiting might not poach birds from the wild, they may purchase them. They also education through radio, TV, and the production of materials that teach with moral instructions as an ulterior motive. There are educational outreach programs that inform school children of various environmental issues in Costa Rica. The future of any country or program lies within the children that will become future leaders and activists. 2) Costa Rican Wildlife Rescue - They rehabilitate injured, orphaned and mistreated animals held in captivity. They then release them back into the wild if possible. Sadly, some are non-releasable and remain to serve as educational ambassadors for their species. Besides its direct humanitarian importance, the wildlife rescue program often helps endangered species of Costa Rica that are very important to the local ecosystem. 3) Care of Endangered Species - They care for endangered species in captivity to give them a fighting chance in the future. The goal is to breed national species for reintroduction into the wild. They have successfully bred the scarlet macaw, green macaw, curassow, guan, and about 50 other native bird species with the help of a human-infant incubator. The breeding center is off-limits. There was a large area for the Scarlet Macaws with nesting boxes and a high wall mural explaining the reproduction process. I was very impressed with the educational focus explaining on the individual signs not only a bit about the animal but also why the particular species is headed for extinction. Plants also had information on what animals consumed it as a food source. The ZooAve photo album has some detailed information on some photos if you look at them in full view.